A few weeks back, Tania made a card like this for her Just Add Ink Design Team Submission for a Sketch Challenge. Well ... I totally fell in love with every square centimetre of it, particularly the beautiful paper rose. I was pretty excited to see that her contribution the other night at Stamp Class was a tutorial on how to make one of our own!! Can you hear my squeals of delight?? 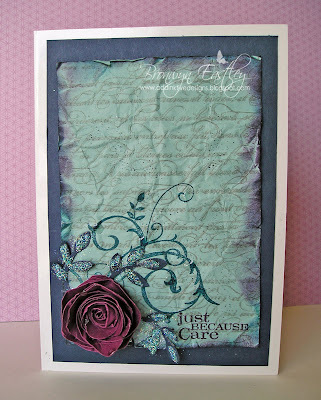 I love the layout and the colour combo and can't wait to try it out in other colours too! Oh! 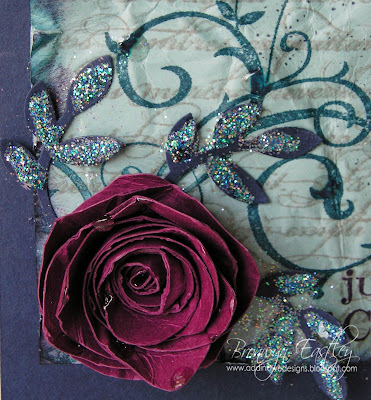 and looky below at the gorgeous card I received in the mail from Tania last week. I think all the JAI girls got spoilt. Thanks, buddy ... I'll treasure it! I'm going to miss Pale Plum!! Gorgeous! Love that rose. 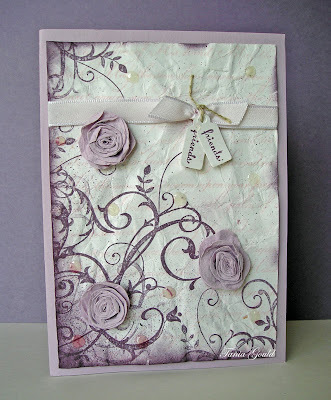 How special is that lovely pale plum card, I got one too and it made me smile all day!